Fund for Assistance to the ROCOR - I Can See Clearly Now! Thanks to your generosity, Fr Alexander is no longer in danger of losing his sight. A few years ago, he had an operation that prevented him from completely losing his vision. Although his condition had improved after the operation, very expensive eye drops were essential to help him retain his sight. Like nearly all our monastics, Fr. Alexander doesn’t have health insurance, so he couldn’t afford the medicine that was crucial to preserving his remaining vision. Thanks to the help of generous people like you, the FFA sent help to the monastery, which allowed the brethren to take care of many different projects on the monastery grounds, and paid for such daily expenses as food and healthcare. As a result, Fr Alexander was able to get the medicine he so desperately needed. “Each one of our brethren is precious to us. Fr. Alexander is now able to do his obedience unhindered, an obedience which provides our people with pure beeswax candles, and, of course, a source of income for the monastery. 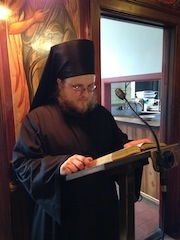 If it weren't for this good eye care, he would be blind, he would not be able to work, or read and sing on the kliros, which would be a tremendous loss to all of us,” said monastery Treasurer Hieromonk Theophylact. Other projects Jordanville was freed to pursue: a better kitchen for the growing needs of the monastery, a new mail room and publications office, some brick work on the deteriorating buildings, a small fitness room for seminarians, among others. Please help our Church - donate to the Fund for Assistance today!